Osaka, often referred to as the soul of Japan’s Kansai prefecture, is an integral stop on any tour of the Land of the Rising Sun. Experience Osaka’s neon-fronted nightlife, exceptional food, and buzzing markets on a 3.5-hour sightseeing tour. Sightseeing highlights include Kuromon Ichiba Market, famed for its gourmet hole-in-the-wall restaurants, Tsutenkaku Tower in Luna Park, and Dotonbori, a canal-side strip home to neon sigs and a giant mechanical crab. Japanese snacks, including octopus balls and skewered meat, are included on this small-group tour, limited to 12 people. Your Osaka sightseeing tour begins at exit 10 of Nipponbashi station at 5pm. From here, you’ll follow your guide to Kuromon Ichiba Market, famed for its hole-in-the wall restaurants and plethora of market stalls. Next, stroll onto Sennichimae Doguyasuji Shopping Street, where countless cooking utensils jostle for space with unique souvenirs, before entering Shinsekai, the core of Osaka’s famous downtown. Admire vibrant landmarks such as Tsutenkaku Tower, Osaka’s answer to the Eiffel Tower, and Luna Park, and sample a local favorite, kushi-katsu (deep fried meat or vegetable skewers) as you pass inviting izakaya (Japanese-style pubs). Then, you’ll arrive in Osaka’s most famous enclave, Dotonbori. 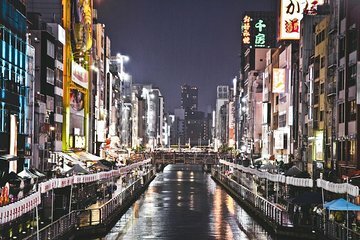 Under the ambient cloak of darkness, the canal-side strip bursts into life with neon lights and animated signs, the most well-known being ‘The Running Man.’ Snap photographs of the enormous mechanical crab, sample Osaka staple takoyaki (fried octopus balls), and receive recommendations for restaurants and bars from your guide. Your tour concludes at Namba station, located in Dotonbori, at around 8:30pm. Tour guide was unfriendly, definitely not a people person. Kept emphasising areas on the tour that he didnt want to do or would rather swim across than go through. On arrival I smiled to say hello and he wouldnt even smile. He was also too softly spoken and hard to hear. Disinterested and judgemental, I wouldnt recommend.